Victors, Keegan Ales and Stanhope House! I recently brought my son Jasper to The Fodera Guitar factory in Brooklyn NY so he could check out how they were building my new guitar. 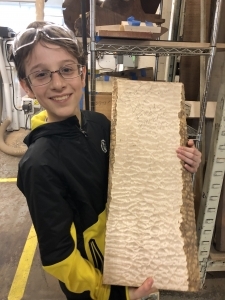 He’s pictured with the beautiful quilted maple that will be the top of my new Fodera Emperor which I hope to get by mid August! This week I have three more big shows! Thursday June 21st I will be with Roger Zee and Rudy Feinauer at VICTOR’S 8pm 500 Commerce Ave Hawthorne NY. I always love going to VICTOR’S to see all my Westchester friends! Friday June 22nd I reunite with the guy who taught me how to play guitar and the friend who I’ve known the longest in my life Mark Marshall for a special show at KEEGAN ALES 20 Saint James St Kingston NY (w/ Mark Marshall) 9pm. It’s always a treat to play with Mark. He rocks real hard! Saturday June 23rd 8pm I will be at the legendary STANHOPE HOUSE 45 Main St Stanhope NJ for my last show of June. Special guests will be the owners of Stanhope House Matt and Jon Klein and Tara Layne will also join us sometime on the first set. Featuring Buddy Allen on bass and Sam Bryant on drums. http://www.davefields.com/wp-content/uploads/2015/06/davefeatured.jpg 172 499 davefields http://www.davefields.com/wp-content/uploads/2018/06/davefields.jpg davefields2018-06-19 11:35:012018-06-19 11:36:06Victors, Keegan Ales and Stanhope House!